IT WAS brisk business at West Byfleet’s Super Saturday event last weekend, when traders and charities attracted shoppers to buy locally – especially for festive purchases. Hundreds of people converged on the village centre to seek out bargains and specialities, and to support their local shops and stalls run by community groups. Choirs from the Marist Catholic Primary and West Byfleet Infant Schools provided entertainment and Father Christmas made an early visit. 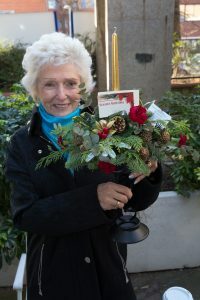 Gloria Wier who makes Christmas Decorations, with examples of her skill. West Byfleet & Pyrford Residents’ Association presented a cheque for £300 to pay for the village Christmas tree and also for a tree in tribute to the late Jerry Kane, a ‘traditional’ manager of the NatWest Bank branch. Jerry, who was well known in the village, sadly died unexpectedly from a heart attack at the age of 54 on 22 November. His memorial tree is outside the bank in Station Approach. A special calendar featuring ladies from the village who dared to bare all in aid of the Dennis Ralph Foundation was being sold by Beate Ralph and her son Steven. Beate’s three-and-a-half-year-old son Dennis died of a brain tumour in 2007, and the charity was set up to support families who have someone who is suffering a serious illness. Jonathan Lord MP with Father Christmas and Pauline Hedges. The Belles of West Byfleet calendar is available via the foundation’s Facebook page. Also raising money were the 1st West Byfleet Guides, selling Christmas wares to help pay for a trip abroad. They have a page at easyfundraining.org where shoppers can support the group with donations while shopping online. 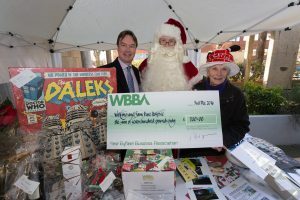 West Byfleet Business Association did its bit for charity when it handed over a cheque for £700 to the Woking & Sam Beare Hospices. The money, raised at the association’s Summer:Live event this year, was accepted on the charities’ behalf by Woking MP Jonathan Lord. One of around 300 MPs supporting the Small Business Saturday campaign nationwide (www.smallbusinesssaturdayuk.com), Mr Lord told the News & Mail: “West Byfleet was in a wonderful festive mood on Saturday with an array of stalls and stores doing a great trade. Refreshments were also on sale including burgers provided by JL Butchers of West Byfleet and Christmas pudding-infused vodka from the Animals Asia charity stall. This year’s could be the last Super Saturday in the village for some time due to work starting on the site of Sheer House. The seven-story building in the centre, which currently houses offices, a car park, shops, banks, chemists, coffee shops and the Post Office, is due to be demolished and the land redeveloped. During Super Saturday, the association surveyed visitors about their parking needs, as spaces will be severely limited once the Sheer House car park is closed. The association will be talking to Woking Borough Council about how extra spaces can be provided during the redevelopment.